In Montessori, the ages of 6 to 12 are called the second plane of development. The second plane brings a whole new world of exploration to the child. They are no longer focused on just the realities of the world around them, but they are interested in figuring out their place in this big world. This is the time when creativity sores, and when an interest in fantasy and imagination take off. Their social group becomes more important, as does their sense of community. All of these changes mean that children are interested in very different materials than they were from birth to 6. Gone are the cutesy little puzzles and stackers. Instead, these children crave open ended materials in which to explore, and create. They are ready to deeply explore personal interests, and what is interesting to one child, may not be at all interesting to the next. For these reasons, I can't give you a list of materials that every 6 to 10 year old will love. You will need to follow your own child's interests. Still, you'll want to keep basic Montessori ideas in mind! You'll want to offer high quality materials, materials that focus on real skills where necessary, and you'll want to respect your child's own pace, interests, and ability. Here are some Montessori Friendly gift ideas for 6 to 10 that can help to spark ideas for your own child! Glüx Board Game -- on Henry's list for 2017! Monopoly | Trouble | Sorry! | Guess Who? Large Human Anatomy Model -- I want this one for me! iPod Nano -- seriously considering for Henry, for music and podcasts! Lego -- the most used toy by Henry in our home! National Audubon Society Field Guides -- these come in a bunch of different subjects! Hammock Swing -- so pretty! Washi Tape -- We go through so much washi tape for projects here! Keep in mind that these are just examples, and the exact age range will vary. Also note, that this is way way more than an one child would need. 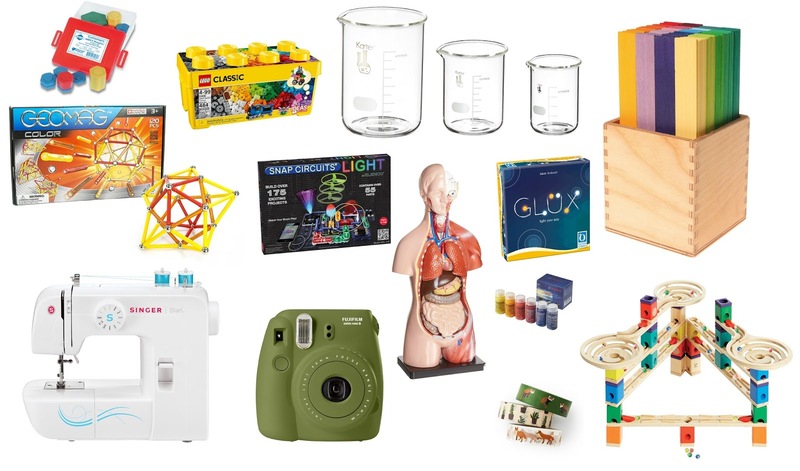 Pick and choose gifts that work for your child his or her interests! Need a gift for a younger child? Check out my Ultimate Montessori Toy List from Birth to 5! This post was brought to you as part of the 12 Months of Montessori Series! This month's theme is gift lists! Check out these great Montessori and Montessori Inspired lists for the holiday season! What a great list! Thank you so much! I am looking for a a desk for my six year old daughter - preferably something with drawers. Do you have any recommendations? This is very informative guideline. These types of knife is very suitable for kids because it made by plastic and it is very safe.